It was nearly 11 PM, E.S.T., and the sudden announcement that President Obama was about to make an important announcement “related to national security” had been hanging in the air for almost a half hour, as TV reporters, hosts and anchors speculated and waited. I was jumping back and forth between two networks when the news began leaking out about what the announcement would be: Osama bin Laden had been killed in a U.S. operation. The professional ethics on both networks promptly evaporated, as Walter Cronkite, David Brinkley and Howard K. Smith looked down from news anchor heaven and retched. On Fox, the lucky host who had airtime when the story broke was Geraldo Rivera, who reacted to the news coming in over his earphones like a little girl finding a pony by the tree on Christmas morning. He cheered, he clapped his hands, he whooped, he laughed, setting my mind racing back for other examples of announcers disgracing themselves as they reported dramatic events. 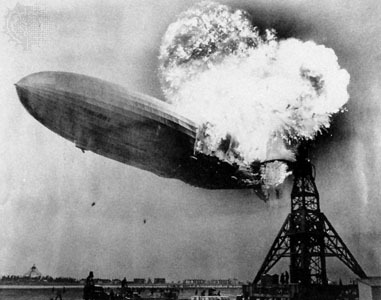 There was Herb Morrison, the on-the-scene radio announcer in New Jersey who completely lost his composure when the Hindenburg burst into flames (“…the back motors of the ship are just holding it just, just enough to keep it from — It burst into flames! It burst into flames, and it’s falling, it’s crashing! Watch it! Watch it, folks! Get out of the way! Get out of the way! Get this, Charlie! Get this, Charlie! It’s fire—and it’s crashing! It’s crashing terrible! Oh, my, get out of the way, please! It’s burning and bursting into flames, and the—and it’s falling on the mooring-mast and all the folks agree that this is terrible, this is the worst of the worst catastrophes in the world. Ohhhhh! It’s–it’s–it’s the flames, [incomprehenseible] oh, four- or five-hundred feet into the sky and it … it’s a terrific crash, ladies and gentlemen. It’s smoke, and it’s flames now … and the frame is crashing to the ground, not quite to the mooring-mast. Oh, the humanity and all the passengers screaming around here. I told you, I can’t even talk to people whose friends are on there. Ah! It’s–it’s–it’s–it’s … o–ohhh! I–I can’t talk, ladies and gentlemen. Honest, it’s just laying there, a mass of smoking wreckage. Ah! And everybody can hardly breathe and talk, and the screaming. Lady, I–I’m sorry. Honest: I–I can hardly breathe. I–I’m going to step inside, for I cannot see it. Charlie, that’s terrible. Ah, ah—I can’t. I, listen, folks, I–I’m gonna have to stop for a minute because I’ve lost my voice. This is the worst thing I’ve ever witnessed!) of course, and New York Giants broadcaster Russ Hodges, who morphed from reporter to fan when Bobby Thompson hit his 9th inning “shot heard ’round the world” home run to win the 1951 National League pennant play-off against the Dodgers (“The Giants win the pennant!!! The Giants win the pennant!!!! Haaaayooooo!! !“) Rivera didn’t have the excuse of either of them, though: he wasn’t on the scene, witnessing history live, and he isn’t just a local reporter. Cheering the news, any news, is a breach of journalistic ethics, and acting like Rivera did last night reaches lowest depths of unprofessional conduct. Except, perhaps, for the conduct of Wolf Blitzer. While Geraldo was whooping, Blitzer was withholding information from his audience, looking straight into the camera uncomfortably and mumbling about how “multiple sources” were “confirming” that the President was going to announce something “really, uh, really momentous” and “uh, we should be getting, uh, that announcement that is something we have been waiting to, uh, waiting to hear for a long time..”. WHAT, Wolf? What do you know? This isn’t a parlor game, it’s the news, for God’s sake, and when a news reporter knows the news, he’s supposed to report the news. Blitzer certainly appeared, for some reason—instructions from CNN, perhaps? The White House?—-to be trying to hold off the announcement so President Obama could make it, so as not to spoil President’s bi moment. Is this possible? Since when does the news media withhold information to allow a leader or politician to make a big splash? That’s not their job, and I have never before had such a thought enter my mind: the closest thing to it is when I curse local news broadcasts that use teasers before commercial breaks ( “Something is lurking in your house that may kill your family! The story, when we return.”). Blitzer obviously knew Osama was dead and he was stalling, conduct that was a breach of his duty to report as well as being futile and dumb, since the news of Osama’s death was being reported by a giggling, giddy Geraldo on Fox, and probably elsewhere as well. It was now past 11 PM; viewers wanted to go to bed: What, Wolf? What? Finally a CNN reporter got on the phone with Wolf and spilled the beans; Blitzer, of course, showed no hint of surprise. He just looked relieved that he didn’t have to be the one to steal Obama’s thunder. I don’t know how the other networks handled the moments before the President’s welcome announcement. But if there is any profession in America’s whose professional standards have declined more precipitously in the last few decades, I’d like to know what it is. So I can stay away from it. ← Should It be Illegal to Buy Counterfeit Designer Goods? Ha. When the speculation was at it’s peak and the topic was only “national security”, I thought for sure that Obama was coming out to confirm that, indeed, Superman had relinquished his US Citizenship. Even in death, Osama mocks us all. I think you’re too hard on Herb Morrison, who might not have been equipped for what he saw, but yeah. NBC’s coverage was alright. That’s what I watched. It was the first time I put on the national news on purpose since 9/11 itself, I think. Irrelevant side note: They said they identified him through DNA testing. I didn’t think that could be done that fast. I guess it can. The thing is that if he had been professional, nobody would remember him. Sane with the Giants announcer. Red Barber, the Dodger broadcaster, let the crowd’s screams tell the story—but then his team had lost. I think they are now saying that the DNA evidence story was wrong. that was part of the initial report that he had been killed a week ago, which never seemed plausible anyway. Glad to know I’m not the only one driven to distraction by that crap. “A rapid dog spreading terror in Northern Virginia, later on in the broadcast.” I actually heard this one…took 20 minutes to get the story, and the dog had been shot. I LIVE in Northern Virginia—can I know NOW please?